Become a Naper Settlement Member Today! 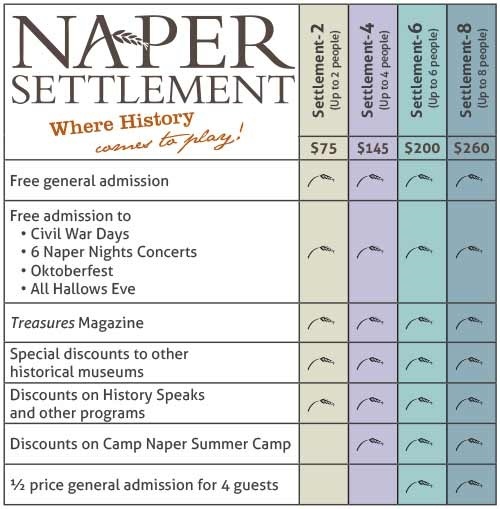 Enjoy all that Naper Settlement has to offer by becoming a member today! Experience a museum that connects visitors through engaging and fun experiences, special events and programs. Sprawled across 13-acres, visitors can explore the beautiful museum grounds, 30 historic buildings, and learn how the past relates to the present from costumed interpreters. When you become a member at Naper Settlement you can explore Naper Settlement for free anytime of the year. You and your family will not only receive free general admission to our outdoor history museum, but your membership helps to preserve our region's rich heritage. The two adults on any membership application must live in the same household. Membership Cards are valid only for the members listed on the card. Cards may not be loaned or given to anyone else to use. Identification with the member's name and address is required. In conjunction with the Missouri History Museum, Naper Settlement is part of Time Travelers, a reciprocal membership network for more than 200 historical museums and societies throughout the United States. To view a list of participating organizations and discounts available, visit their website.